We all like superhero movies, especially underdog stories. Captain America: The First Avenger (2011) will no doubt be one to see this July, as Marvel Studios once again seeks to bring out a classic. Originally based on a novel, this new flick is a remake of the first 1990s film, and with a new cast of big names as well. The movie is set in the Great Depression era, with a Steve Rogers, a frail youth born into a poor family. Seeing the war and spurred to take action, he is rejected by the army and deemed unfit for military service. Then steps in General Phillips, who offers Rogers the opportunity to participate in a top secret military experiment. Happy ending, right? But the movie has just begun. Operation: Rebirth is not just some government experiment that goes wrong; this one actually seems to do the job. Steve Rogers is transformed from a frail youth to a 'Super Soldier', thanks to the "Super Soldier Serum". Three months later, he is given his first assignment as "Captain America". As leader of the Avengers, it is his job to continue the war on evil and lead his team to victory. Of course, with every superhero, there also has to be an arch enemy. In this movie, it's the Villainous Red Skull, head of the Hydra Organisation. Roger teams up with two sidekicks and armed with his indestructible shield, to take down his enemy in a classic battle of the best. To add to the engaging film comes a lineup of great actors. Most notably, Chris Evans, who's last superhero-action movie was Push (2009). Evans, who plays Captain America, gets more screen time and doesn't seem to have any major weakness as such, in comparison to the 2009 flick. Tommy Lee Jones joins the cast after a period of silence in relation to his appearance on the big screen. He plays the Colonel Phillips, who initially has a dislike for Rogers, is the first to offer Rogers the chance to participate in Operation: Rebirth. Although not as amusing as his role in the Men in Black series, he still occasionally shows his humorous side in this movie. Samuel Jackson plays a brief but significant role in this movie, adding to his arsenal of roles which he has pulled off in past movies. It is always interesting to see which character he plays (whether good or bad), but I'll leave it undisclosed and let you find out. The story flows well, and also has an engaging storyline. Although set in the 1940s, it has a new school feel to it, enhanced by the special effects and casting role. The film also shares some similarities with the Iron Man series. 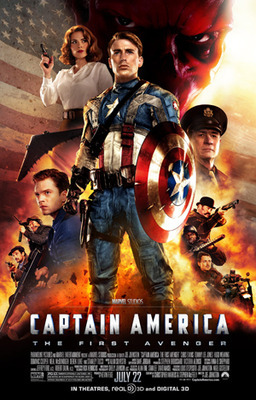 If you are an action movie fan, then Captain America: The First Avenger will be right down your alley. For those familiar with recent Marvel flicks, you will know that this film company sure delivers action-packed thrillers. So if you are feeling in the mood for a superhero flick with heaps of action (and an actual storyline), head to your local cinema, and take your mates as well. Check out the official website for all the latest cinema information and free promotional materials.